Who Makes the Crop Circles? A group of around 30 dowsers spent two fascinating days in Wiltshire trying to unmask the mystery of this year’s crop formations. Patterns that had obviously been made by revellers were eliminated from our study, with dowsing work focused on several sophisticated and beautifully formed designs. The nearly unanimous conclusion was that these formations had not been “made” by human beings. 1. White Hill, Lockeridge; three propellers within a large outer circle; wheat; 4 days old. 2. East Kennet near Avebury; two formations in the same field of wheat; (a) a large square within a circle. The square resembled a microchip circuit containing 400 small squares of standing wheat. (b) The other was in the shape of a heart surrounded by many small circles; 20 days old. Very few people dowsed the heart formation. 3. Bishops Cannings near Devizes; two squares within a circle forming a repeated 8 pointed star motif; wheat; 23 days old. 4. South Field, Alton Priors; 16 petals and a central flower in barley. The image resembled one of the rose windows at Chartres Cathedral; 31 days old. We were fortunate to have ideal weather conditions, which allowed us to make good use of the canal-side facilities of the Barge Inn at Honeystreet. Each dowser was given a plan of the formations and a short questionnaire. Many dowsers were selective about which part of the questionnaire they answered. Nevertheless, some key findings emerged. These are described in the following paragraphs. One of our main interests was to solve the chicken and egg conundrum. Were the earth energies in place before the formation of the crop circle or were they laid down by the arrival of the circle? The answer to both questions was yes! 94% of dowsers confirmed that earth energies were present before the circle was formed. However, 69% found that the energies had changed with the laying down of the formation. The explanation of this apparent contradiction relates to the different types of energy that are found (and the over simplistic question that was asked). The common types of energy found were deep underground streams, shallow veins of water, bands of ley energy, blind springs and downshafts. 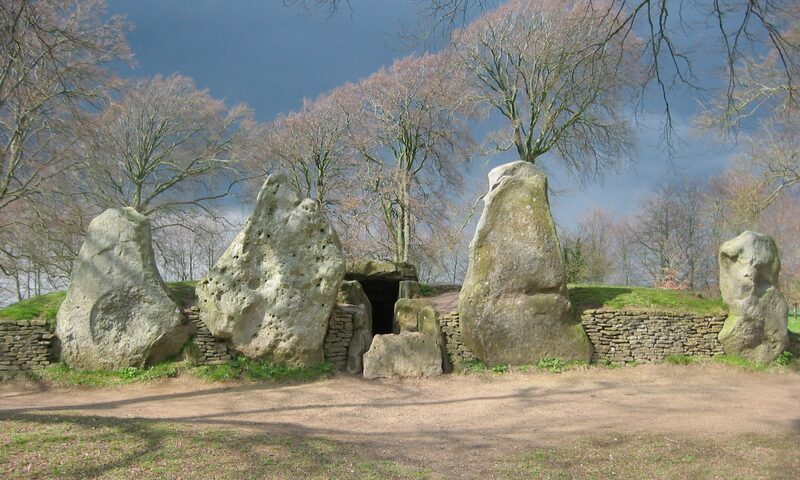 Many people found deep underground streams or bands of ley energy crossing at or close to the centre of the circles. The bands of ley energy could often be tracked to nearby churches or topographical features. This feature was frequently reported at Bishops Canning and South Field but mentioned less at White Hill and East Kennet. Each formation also appeared to rely on a number of blind springs and downshafts. Downshafts and small energy vortices were often found at points where the direction of lay of the crop changed. It was also common to find a blind spring radiating from the centre of the circle with (often 7) concentric rings (not a spiral) matching changes in the pattern of the crop. There were a number of water veins close to the surface that ran from blind springs and to downshafts. These often followed the outline of key shapes. It is these shallow veins of water that appear to have been moved when the circle was formed. Some dowsers identified a grid of alternating positive and negative lines centred on the circle. The direction and power of these lines related to the direction in which the crop was laying. In addition to the horizontal patterns a seven-turn energy helix was found around a vertical double diamond cone of energy at the centre of one formation. At another site the energy pattern was described as a dome rising to a height of 250 ft above the field. One attempt was made to measure the strength of the energies. This gave a Bovis Biometer reading of 4,000 outside of the circle; 7,000 just inside and 30,000 at the centre. Dowsers were asked to note any physical, mental, emotional or spiritual sensations whilst they were in the circles. A few people (13%) reported negligible or minimal change. The majority reported feelings that were “good”, “calming”, “peaceful”, and “loving”. Whilst others experienced significant change – “The experience was electric. It was like being on a playground ride…..It was like being in a storm at sea”. The intensity of the sensation seemed to vary at different points within the formations. The centres of blind springs and downshafts created the most noticeable change. Kineisiology tests confirmed a depletion of muscle strength at key points and lines. The direction of lay of the crop also affected most people. Walking in the same direction as the lay of the crop was found to be easier than walking against the lay. There were very few mentions of tiredness and loss of energy but it was noticeable that dowsing in the circles for a length of time led to physical side effects. By mid afternoon most dowsers had stopped walking around and were sitting quietly in the circles (this appeared to bear no relationship to age or alcohol consumption). Other effects included a feeling of “pins and needles” and one dowser reported that his back pain had eased. A follow up letter explained that one dowser had felt physically, mentally and emotionally drained following the weekend but had then recovered quickly to become fitter and more “sorted out” than for months. One technique that is used to check whether a crop circle has been man made or not is to measure the difference in crop samples taken from inside and outside of the formation. Several people dowsed the aura of the seed heads (wheat or Barley). The measurements used varied between imperial, metric and paces. Nevertheless, a distinct difference was noted. The measurements have been converted into standard units for ease of comparison. Seed aura outside of circle 1 unit. The auras of the seed heads taken from within the formation were at least double that of the seed heads from outside of the formation. The difference in measurement may be partly due to the age of the formations. In general, the most recent formation (4 days old) gave higher readings in the circle than the other, older formations. Another variant may be the precise location at which seed heads were collected. Those collected over downshafts, blind springs or edge lines may give different readings (more research needed). Some people also tested the moisture content of the soil. In every case the soil was considerably drier within the formation than outside. This was most noticeable at the most recent formation (White Hill) but was still apparent in circles that had formed and been exposed to the elements for 3 or 4 weeks. The total does not equal 100 as more than one answer could be ticked. Unfortunately this doesn’t answer the big question. It is clear that the earth and its energies play a significant part in the formation of crop circles. It is also apparent that there is some other creative force at work. The headings used of “previous civilisations” and “other civilisations” have an influence but they do not provide the full answer. As with a lot of dowsing our task is to define the right question to ask. Any suggestions will be gratefully received. We received a bonus, for the second year running, of the arrival of a spectacular new crop circle during our stay. This has turned out to be the most sophisticated design to date. It has over 450 different diamond shapes set between radiating lines. It was nicknamed the bar magnet or magnetic field as it resembled the patterns made by iron filings around a bar magnet. A few of us were fortunate to enter the formation at dusk, within 24 hours of it appearing. The experience was exhilarating and resulted in a sleepless night. Subsequent studies by the Wyvern Dowsers have shown that the “magnet” points due north and south. It has also caused the Michael Line to divert from its well-plotted course and pass through the formation. This adds more fuel to the chicken and egg debate. Significant earth energies were present at or near the site before the crop circles were formed. Deep water or energy lines cross at or close to the centre of the formation. Blind springs are often found at the centre of symmetrical circular patterns. Downshafts or energy vortices mark the focal points of the crop pattern. Shallow veins of water follow the shape of many designs. Many of these shallow water veins appear to have been shaped close to the time of creation of the circle. Many people are affected physically or emotionally either during or following a visit to a circle. The auras of seed heads taken from within the circle are considerably larger than the auras of heads in the surrounding crop. The moisture content of the soil is significantly lower within the circle than outside. Forces other than mankind appear to be involved in the formation of these patterns. Thanks are due to everyone who turned up and contributed to the weekend especially those who shared their specialist knowledge E.g. Jim Lyons, Michael Glickman, Dave Sangwine and Alies. Special thanks also go to Paul and Caroline for the pre event organisation and splendid hospitality on the Saturday evening. Acknowledgements also, to David Russell for the photographs from the air and www.cropcircleconnector.com for information about the circles. If you would like to discover more about crop circles, I recommend that you try their web site.